In this initial section of Guided Learning, you learn what Power BI is, how its building blocks work together, and how you can use them to gain insights to your data. Welcome to Guided Learning for Power BI. This self-paced online course explains Power BI in a sequential way, so you can build your knowledge from the ground up. The course is designed to provide guidance in understandable chunks, with logical flow that helps you absorb concepts, details, and examples. It includes lots of visuals and videos to help you learn, too. This Guided Learning course contains many sections, and each section has many topics. After the first few topics in this Getting Started section, nearly every topic includes a video describing what you’ll learn. The content below the video further explains the concept, letting you review and learn at your own pace. If you're a beginner with Power BI this course will get you going, and if you're a Power BI veteran this course will tie concepts together, and fill in the gaps. We hope you enjoy the course, and look forward to including more content in the future. Power BI is a collection of software services, apps, and connectors that work together to turn your unrelated sources of data into coherent, visually immersive, and interactive insights. Whether your data is a simple Excel spreadsheet, or a collection of cloud-based and on-premises hybrid data warehouses, Power BI lets you easily connect to your data sources, visualize (or discover) what’s important, and share that with anyone or everyone you want. Power BI can be simple and fast – capable of creating quick insights from an Excel spreadsheet or a local database. But Power BI is also robust and enterprise-grade, ready for extensive modeling and real-time analytics, as well as custom development. So it can be your personal report and visualization tool, and can also serve as the analytics and decision engine behind group projects, divisions, or entire corporations. Power BI consists of a Windows desktop application called Power BI Desktop, an online SaaS (Software as a Service) service called the Power BI service, and mobile Power BI apps available on Windows phones and tablets, as well as for iOS and Android devices. These three elements – the Desktop, the service, and Mobile – are designed to let people create, share, and consume business insights in the way that serves them, or their role, most effectively. How you use Power BI may depend on your role in a project or on a team. And other people, in other roles, might use Power BI differently, which is just fine. For example, you might primarily use the Power BI service, but your number-crunching, business-report-creating coworker might make extensive use of Power BI Desktop (and publish Desktop reports to the Power BI service, which you then view). And another coworker, in sales, might mainly use her Power BI phone app to monitor progress on her sales quotas, and to drill into new sales lead details. You also might use each element of Power BI at different times, depending on what you’re trying to achieve or what your role is for a given project or effort. Perhaps you view inventory and manufacturing progress in a real-time dashboard in the service, and also use Power BI Desktop to create reports for your own team about customer engagement statistics. How you use Power BI can be based on which feature or service of Power BI is the best tool for your situation – but each part of Power BI is available to you, which is why it’s so flexible and compelling. We discuss these three elements – the Desktop, service, and Mobile apps – with more detail a little later in this Guided Learning course. We’ll also create reports in Power BI Desktop, share them in the service, and drill into them on our Mobile device in upcoming articles, too. A common flow of work in Power BI begins in Power BI Desktop, where a report is created. That report is then published to the Power BI service, and then shared so users of Power BI Mobile apps can consume the information. It doesn’t always happen that way, and that’s okay, but we’ll use that flow to help you learn the various parts of Power BI, and how they complement one another. Okay, now that we have an overview of this course, what Power BI is, and its three main elements, let's take a look at what using Power BI is like. Now that you know the basics of Power BI, let’s jump into some hands-on experiences and a guided tour. Your video tour guide is Will Thompson, a Program Manager on the Power BI team at Microsoft. There are a few guest guides too, a little later on in the course. Bring data into Power BI Desktop, and create a report. As mentioned earlier, you might spend all your time in the Power BI service, getting data and creating dashboards – that’s just fine. Someone else on your team might spend all of her time in Power BI Desktop, which is fine too. In order to help you understand the full continuum of Power BI and what it can do, we’ll show you all of it… then you can decide how to use it to your best advantage. So let’s jump in, and let Will guide us through the experience. The first order of business is to understand the basic building blocks of Power BI, which will provide a solid basis for learning how Power BI turns data into cool reports and visuals. Everything you do in Power BI can be broken down into a few basic building blocks. Once you understand these building blocks, you can expand on each of them and begin creating elaborate and complex reports. After all, even seemingly complex things are built from basic building blocks – buildings are created with wood, steel, concrete and glass. Cars are made from metal, fabric, and rubber. Of course, buildings and cars can be basic or elaborate as well – depending on how those basic building blocks are arranged. Let’s take a look at these basic building blocks, discuss some simple things that can be built with them, then provide a glimpse into how complex things can be created as well. A visualization (sometimes also referred to as a visual) is a visual representation of data, such as a chart, a graph, a color-coded map, or other interesting things you can create to represent your data visually. 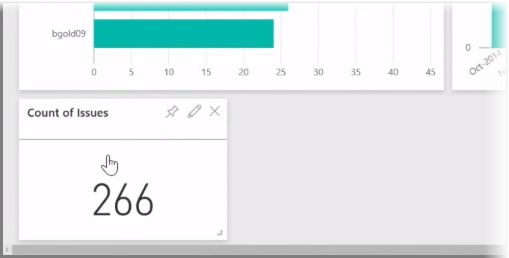 Power BI has all sorts of different visualization types, and more coming all the time. The following image shows a collection of different visualizations that were created in the Power BI service. Visualizations can be simple – like a single number that represents something significant – or they can be visually complex – like a gradient-colored map that shows voter sentiment toward a certain social issue or concern. The goal of a visual is to present data in a way that provides context and insights, either of which would likely be difficult to discern from a raw table of numbers or text. A dataset is a collection of data that Power BI uses to create its visualizations. 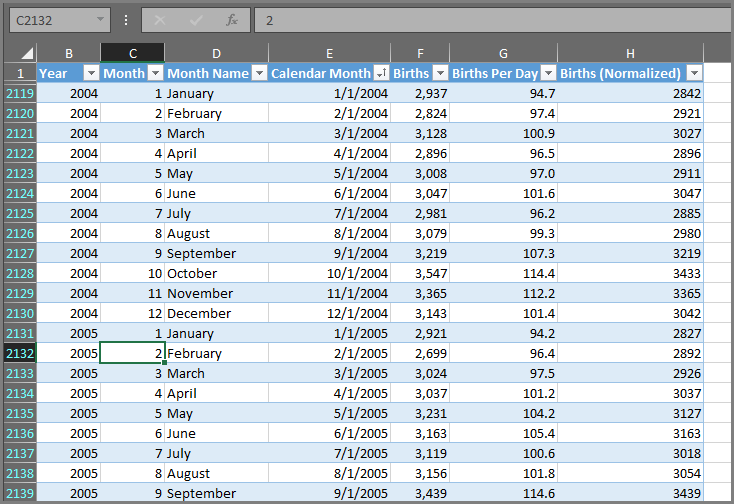 You can have a simple dataset based on a single table from Excel workbook, similar to what’s shown in the following image. Datasets can also be a combination of many different sources, which you can filter and combine to provide a unique collection data (a dataset) for use in Power BI. For example, you could create a dataset from three different database fields, one website table, an Excel table, and online results of an email marketing campaign. That unique combination is still considered a single dataset, even though it was pulled together from many different sources. Filtering data before bringing it into Power BI lets you focus on the data that matters to you. For example, you could filter your contact database so only customers who received emails from the marketing campaign were included in the dataset. Then you could create visuals based on that subset (that filtered collection) of customers who were included in the campaign. Filtering helps you focus your data, and your efforts. An important and enabling part of Power BI is the multitude of data connectors that are included. Whether the data you want is in Excel or an SQL database, in Azure or Oracle, or in a service like Facebook, Salesforce, or MailChimp, Power BI has built-in data connectors that let you easily connect to that data, filter it if necessary, and bring it into your dataset. Once you have a dataset, you can begin creating visualizations that display different portions of that dataset in different ways, and with what you see, gain insights. That’s where reports come in. In Power BI, a report is a collection of visualizations that appear together on one or more pages. Just like any other report you might create for a sales presentation, or a report you would write for a school assignment, in Power BI a report is a collection of items that are related to one another. The following image shows a report in Power BI Desktop – in this case, it’s the fifth page in a six-page report. You can also create reports in the Power BI service. Reports let you create many visualizations, on multiple different pages if necessary, and lets you arrange them in whatever way best tells your story. You might have a report about quarterly sales, a report about product growth in a particular segment, or you might create a report about migration patterns of polar bears. Whatever your subject may be, reports let you gather and organize your visualizations onto one (or more) pages. When you’re ready to share a single page from a report, or share a collection of visualizations, you create a dashboard. 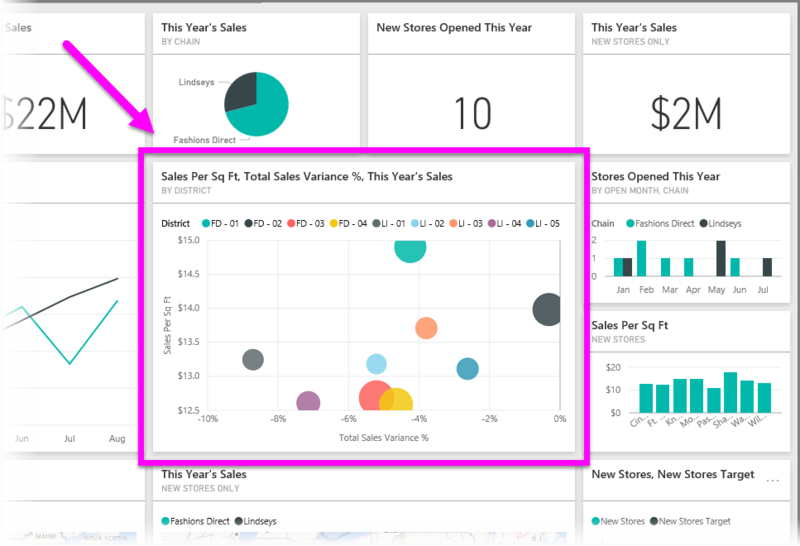 Much like the dashboard in a car, a Power BI dashboard is a collection of visuals from a single page that you can share with others. Often, it’s a selected group of visuals that provide quick insight into the data or story you’re trying to present. A dashboard has to fit on a single page, often called a canvas (the canvas is the blank backdrop in Power BI Desktop, or the service, where you place visualizations). Think of it like the canvas that an artist or painter uses – a workspace where you create, combine, and rework interesting and compelling visuals. 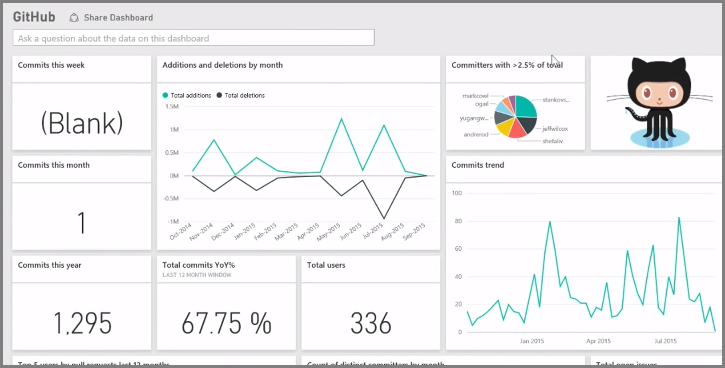 You can share dashboards with other users or groups, who can then interact with your dashboard when they’re in Power BI service, or on their mobile device. In Power BI, a tile is a single visualization found in a report or on a dashboard. It’s the rectangular box that contains each individual visual. In the following image, you see one tile (highlighted by a bright box) which is also surrounded by other tiles. When you’re creating a report or a dashboard in Power BI, you can move or arrange tiles however you want to present your information. You can make them bigger, change their height or width, and snuggle them up to other tiles however you want. When you’re viewing, or consuming a dashboard or report – which means you’re not the creator or owner, but it’s been shared with you – you can interact with it, but not change the size of the tiles or change how they’re arranged. Those are the basics of Power BI, and its building blocks. Let’s take a moment to review. Power BI is a collection of services, apps, and connectors that enables you to connect to your data – wherever it happens to reside – filter it if necessary, then bring it into Power BI where you can create compelling visualizations you can share with others. Now that you understand the handful of basic building blocks of Power BI, it becomes clear that you can create datasets that make sense to you, and create visually compelling reports that tell your story. Stories told with Power BI don’t have to be complex, or complicated, to be compelling. For some people, using a single Excel table in a dataset, then sharing a dashboard with their team, will be an incredibly valuable way to use Power BI. For others, using real-time Azure SQL Data Warehouse tables that combine with other databases and real-time source, which then get filtered in real-time to build a dataset that monitors moment-by-moment manufacturing progress will be the value in Power BI that they seek. For both, the process is the same: create datasets, build compelling visuals, and share them with others. And similarly, the result of both (for each) is the same: harness your ever-expanding world of data, and turn it into actionable insights. Whether your data insights require straightforward or complex datasets, Power BI helps you get started quickly, and can expand with your needs to be as complex as your world of data requires. And since Power BI is a Microsoft product, you can count on it being robust, extensible, Office-friendly, and enterprise-ready. Now, let's see how this works. We'll start by taking a quick look at the Power BI service. 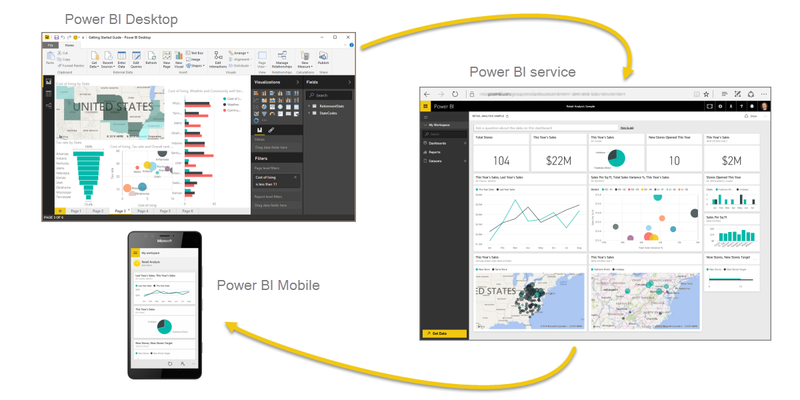 As we learned, the common flow of work in Power BI is to create a report in Power BI Desktop, publish it to the Power BI service, then share it with others so they can view it in the service or on a mobile app. Some people begin in the Power BI service, though, so let's take a quick look at the service, and learn about an easy and popular way to quickly create visuals in Power BI: content packs. A content pack is a collection of pre-configured, ready-made visuals and reports based on specific data sources, such as Salesforce. Using a content pack is like microwaving a TV dinner or ordering a fast-food value meal: with just a few clicks and comments, you're quickly served up a collection of entrees designed to go well together, all presented in a tidy, ready-to-consume package. So let's take a quick look at content packs, the service, and how it works. We go into more detail about content packs (and the service) in upcoming sections; think of this as a bit of taste-testing to whet your appetite. With Power BI, connecting to data is easy. From the Power BI service, you can simply select the Get Data button in the bottom left corner of the home screen. The canvas (the area in the center of the Power BI service) shows you the available sources of data in the Power BI service. 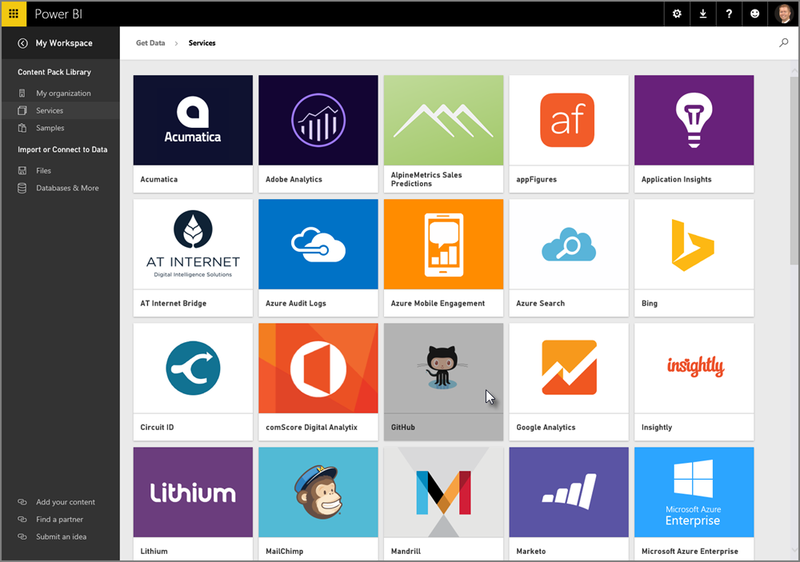 In addition to common data sources such as Excel files, databases, or Azure data, Power BI can connect to software services (also called SaaS providers, or cloud services) such as Salesforce, Facebook, Google Analytics, and a whole assortment of other SaaS services just as easily. For these software services, the Power BI service provides a collection of ready-made visuals, pre-arranged in dashboards and reports called Content Packs. Content packs get you up and running in Power BI quickly with data from the service that you select. For example, when you use the Salesforce content pack, Power BI connects to your Salesforce account (once you provide your credentials) and then populates a pre-defined collection of visuals and dashboards in Power BI. Power BI provides content packs for all sorts of services. The following image shows the first screen of services, in alphabetical order, that is displayed when you select Get from the Services box (shown in the previous image). As you can see from the image below, there are many to choose from. For our purposes, we’ll choose GitHub. GitHub is an application for online source control. Once I enter the information and credentials for the GitHub content pack, it begins importing my data. Once the data is loaded, the pre-defined GitHub content pack dashboard appears. 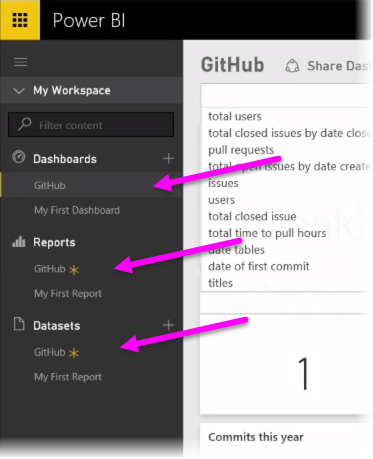 In addition to the Dashboard, the Report that was generated (as part of the GitHub content pack) to create the dashboard is available too, as is the Dataset (the collection of data pulled from GitHub) that was created during the data import, and used to create the GitHub Report. On the Dashboard, you can click on any of the visuals, and automatically be taken to the Report page from which that visual was created. 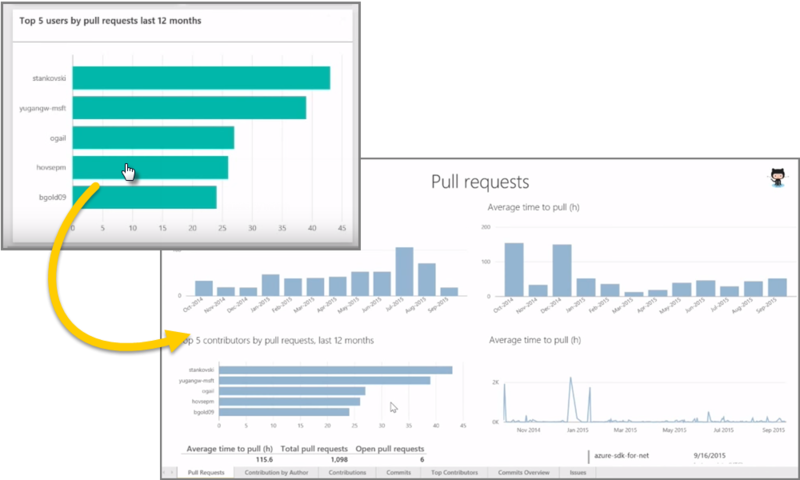 So when the Top 5 users by pull requests visual is clicked, Power BI opens the Pull Requests page in the Report (the Report page from which that visual was created). You can also ask questions of your data, and the Power BI service will create visuals based on your question, in real time. In the following image, you can see Power BI creates a number visual showing the Count of Issues closed, based on what is typed in the Natural Language Query bar. When you have a visual that you like, you can select the Pin icon, to the right of the Natural Language Query bar, to pin that visual to the dashboard. In this case, the visual is pinned to the GitHub dashboard, since that’s the dashboard currently selected. You can also choose to refresh the dataset for a content pack, or other data you use in Power BI. To set refresh settings, select the ellipses (the three dots) next to a data set, and a menu appears. Select the Schedule Refresh option from the bottom of that menu. The Settings dialog appears on the canvas, letting you set the refresh settings that meet your needs. That's enough for our quick look at the Power BI service. There are many more things you can do with the service, which we'll cover later in this course. Remember, too, that there are many different types of data you can connect to, and all sorts of content packs, with more of each coming all the time. Okay, let's move to the next topic, where we summarize this Getting Started section, and get you ready for what's next. Let’s do a quick review of what we covered in this first section. Power BI is a collection of software services, apps, and connectors that work together to turn your data into interactive insights. You can use data from single basic sources, such as an Excel workbook, or pull data in from multiple databases and cloud sources to create complex datasets and reports. Power BI can be as straightforward as you want, or as enterprise-ready as your complex global business requires. 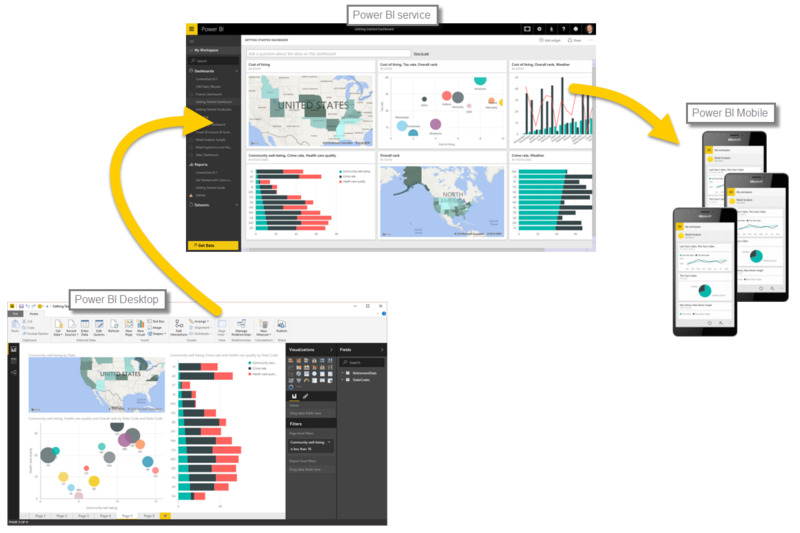 Power BI consists of three main elements – the Power BI Desktop, the Power BI service, and Power BI Mobile – which all work collectively to let you create, interact with, share, and consume your data how you want it. 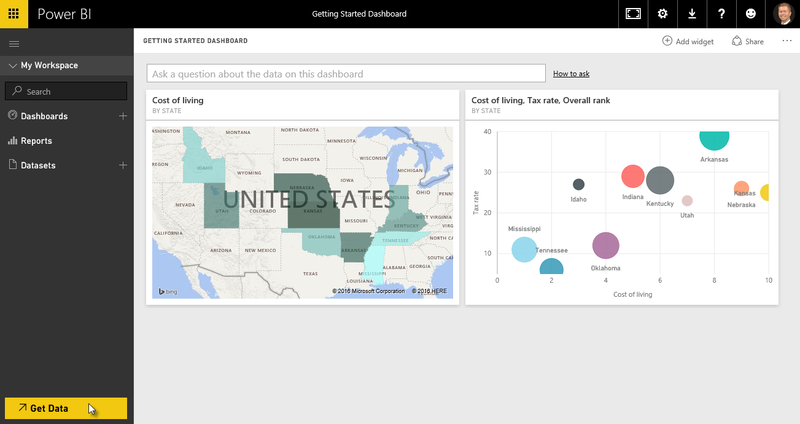 From there, we took a look at Power BI in a video tour with our Tour Guide, Will Thompson. Will gave us a quick overview of how you can analyze and visualize data with Power BI. 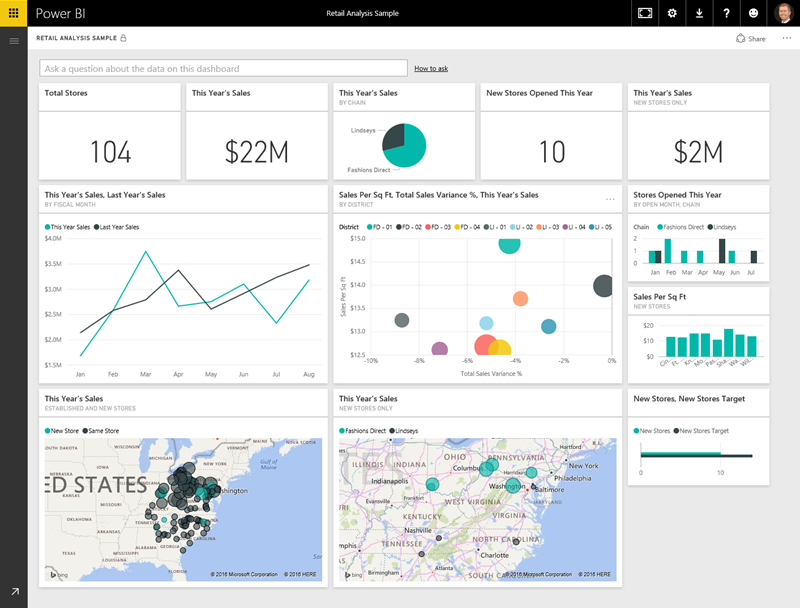 In the Power BI service, we created a dashboard with just a few clicks. 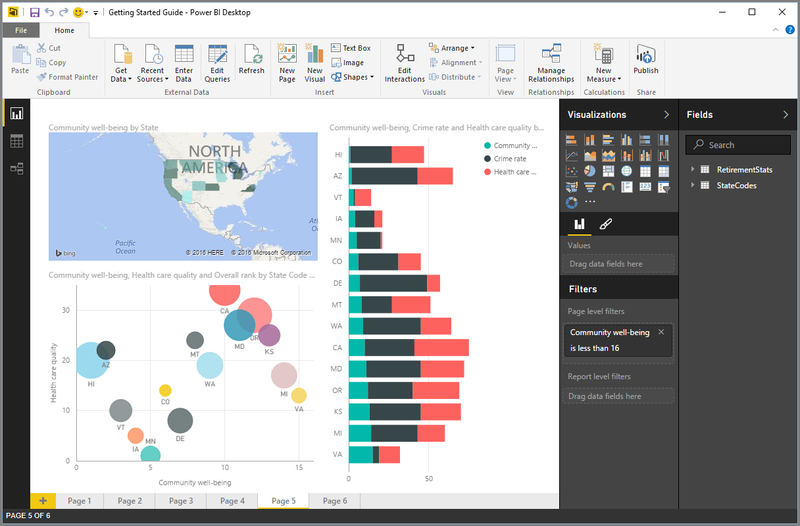 We continued with our glimpse into the Power BI service and used a Content Pack – a ready-made collection of visuals and reports – and connected to a software service to populate the content pack and bring that data to life. We also used natural language queries, called Q & A, to ask questions of our answers, and let Power BI create visuals based on those questions. Lastly, we set up a refresh schedule for our data, so we know when we go back to the Power BI service, that data will be fresh. Congratulations! You've completed the first section of the Guided Learning course for Power BI. You now have a firm foundation of knowledge to move on to the next section, Getting Data, which is the next step in the logical flow of work for Power BI. You might not do all that work yourself - some people will only view dashboards in the service that were created by someone else. That's fine, but because you'll go through all the sections in this course, you'll understand how those dashboards were created, and how they connected to the data... and you might even decide to create one of your own. See you in the next section! 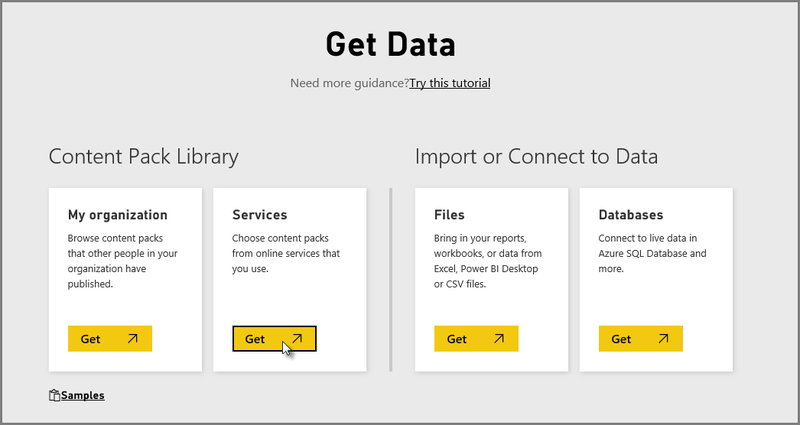 You've completed the Getting started section of Microsoft Power BI Guided learning. Way to go! Now you can move on to the next part of Guided Learning, which is Getting data. Select the Getting data button below to keep going. Liquid error: Can't find the localized string giveDocumentationFeedback for template Tutorial.